When I finish a sculpture…..a funny thing happens. I use so much creative energy, oft times for months, that I’m pretty useless sculpting to a while. After the big buffalo was completed, my father-inlaw and I made our way to Alaska to do a little salmon fishing. We’ve netted 45 in six days. Have six more hours to fish…….. Wish us luck to bring in 50. This entry was posted on Monday, July 29th, 2013 at 3:56 PM	and tagged with Scott Rogers, sculpture and posted in Animals, Uncategorized. You can follow any responses to this entry through the RSS 2.0 feed. I spoke with the foundry yesterday. It should be the next couple of days. I have been surprised myself at how long it’s taken. We have so much work coming through the foundry that things have slowed production completion dates. The guy welding your piece together is good. He’s been welding art for close to 20 years. 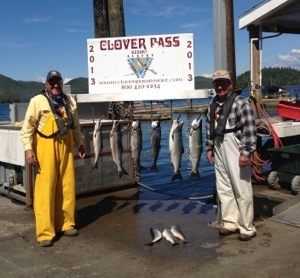 We are coming home with 108#’s of salmon. Headed to the airport now.